In September 2013, Makers Move took to the streets during the “Circuits Bijoux” events in Paris. Makers Move invited and met people in the streets of Paris for a talk about jewellery and small objects. Ann-Belinda's gift from the Tami Nadu tribe. As a young anthropologist, I spent some time living with a mountain tribe in southern India, Tamil Nadu. One day, one of the women I was closest to gave me a necklace. This chain was both a gift and evidence that I had been accepted into their community. The women told me that in the past they had had more of these chains and had used them as a form of currency. 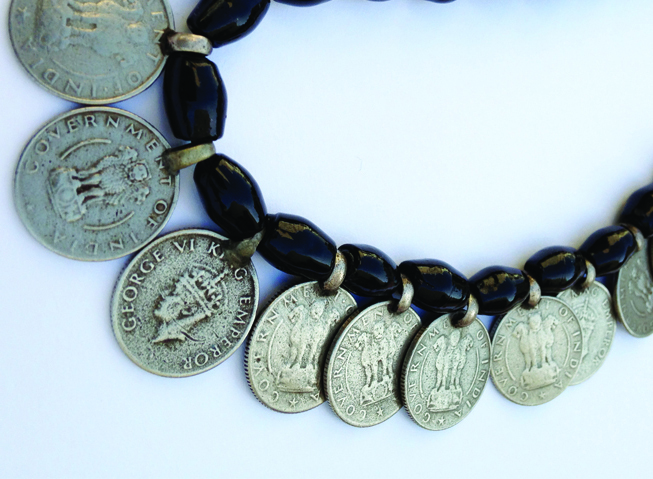 The chain had protective powers and was considered to be a status symbol due to the rupees that were hung on it – old Indian coins from the period just before India gained independence, stamped with the words ‘Kings Emperor’. I enjoyed the intimate companionship of the women. Every day I went with them to a little spring where we bathed together and they would tell each other stories about their men and lovers. I have strong memories of the black glass bead chain and of being together with the women bathing. It was a very sensual experience – the water running off their bodies, their wet saris sticking to them, thick black hair, light brown skin, and the bright sunlight shining on their smiling faces – a time of happiness. The mountain tribe originated from a group described as half Hindu, half indigenous people. Many of their legends recount how at some time in the 16th century the people escaped into the mountains due to political unrest in the lowlands. They killed the men from the tribes who were already living in the mountains and married the women. Apart from trading contacts with the lowlands the mountain tribe had lived in relative isolation for centuries. It was not until 1977, during state of emergency in India, that access to the area became possible. I lived in the mountains for a few months, while I undertook the preparatory work for the field studies that I wanted to carry out later. However, after war broke out in Sri Lanka it became impossible to continue with the fieldwork. The official line was that guerrilla movements from Sri Lanka, the Tamil Tigers, did not train on Indian soil, but they did right next to the village where I was staying. So when the ‘Tigers’ saw me, the people of the village were told, ‘the tall girl with the blond hair must leave’ and I never got to return. It was my professor who encouraged me to continue with the work and to write about southern India. He pointed out that with Tamil refugees coming to Europe, studies in this area would be relevant, so my PhD dissertation ended up being about the Tamil refugees in Europe. Around that time, there was a marked shift in the ethical approach to the definition of a ‘refugee’. As a refugee how do you reproduce culture and what does it mean to be a refugee when a place, a people, and a language, which exists in time and space is disappearing, and the entire framework for its existence has gone? I was fascinated by the whole problem and the concept of being a refugee – what is retained, what is invented and what it means to be on the move, both as a refugee but also in the wider context, from an existential point of view. No anthropologist had studied this mountain tribe before because they had rejected all forms of contact with the outside world. I myself managed to get there via three Danish missionaries, who lived in the lowland area. However, all of this is in the past now. From the 1990s onwards the study of ‘isolated’ tribes was rejected, along with the deeply narcissistic idea of studying a tribe of people as an object. In the aftermath of the colonial era, anthropologists wrote thick volumes which, when read more closely, were mostly just a type of projection. In the 1990s, the focus shifted from projection to listening to a peoples’ own voice and researchers began writing and testing data with the help of local collaborators. Anthropologists also began writing books together with their subjects. Today, it would be inconceivable to go looking for isolated peoples anywhere in the world and anthropology as a subject has therefore also changed in essence, since the 1990s. I learned a great deal from the tribe’s way of life, which was a type of ’green economy’ where everything was either eaten or reused. I learned that it is possible to exist with, and from, very little from a purely material point of view, and I learned that what preoccupies us most in life, can be obtained in entirely different ways. We met Pascal at Bibliothèque Forney, where we parked our mobile workshop on the last day of our stay in Paris. In 1996, I was a college student in Nîmes and at the corner of a street, on a sidewalk, I noticed the first of what would become a long series of found iron shoe taps that I would begin to collect. Intrigued by this worn metal object, I picked it up and mechanically slipped it into my pocket. A few weeks later, during a trip in Switzerland, on a sidewalk again, I noticed a second shoe tap of the same type. This coincidence led me to pick it up and also to wonder about the possible meanings of these findings. Amulets or jewellery, talismans, and lucky charms: each one is a wink or a smile crossed along the way that unexpectedly punctuates my daily routine. Over time and up until today, I have accumulated hundreds of these shoe taps found by chance. We meet Colette on Place Colette – she told us her story of love and loss. When we got married on the 24th of September in 1988, Christian was still a student and I was just about to qualify as a lawyer. We had met seven years ago and felt that time had come to become serious. Christian´s parents, who lived in Bogota, Colombia, at that time, sent us the wedding rings as a present. They were two nice plain golden rings, just what we liked. Christian never wore his wedding ring after the wedding ceremony, I always kept it on my finger for nearly 25 years. Sometimes I mentioned to him, that I thought it was such a waist not to use the ring and he always told me “ then do something with it, it is yours”. Christian died last year, after two years suffering from cancer. It would have been our 25th wedding anniversary this year. For this reason I had the idea to unify both rings. They got melted to one ring and Christians name was carved out and was melted into a gold nugget, which was put up on top of the ring. On the 21st of September 2013 I received the new ring in Paris, it was Christian´s birthday date and 25 years ago, we had spent our honeymoon in Paris. So many coincidences convinced me, that Christian approved my little project. The ring means a lot to me and comforts me every day. It gives me hope for a new start in life, keeping very happy and lovely memories for the man, who was truly the Love of my life! Hei makers on wheels! I have just received the chain-print-medallion, it’s so cool!! I liked the idea of the exchange with people passing in the street, the interaction, and reflections it generates in public about crafts and us makers, the kind of awareness it confronts us with knowing we can’t exist in our elitist bubble, and all this through a smiley, playful experience at the corner of your street. I used to be part of a circus before moving to London, and as we would be on the road most summer months on tour with a bunch from the troupe, we would often engage in the streets, and make street theatre, small sideshows, etc. I really think the street is the base place to communicate and exchange. But, I must admit that receiving this object here in my London studio, in a different context, with its small packaging, card and all, takes your work from simple, communicative and fun to real cool! Thank you so much! Did you say you were going to make a small publication too? Keep me posted and I look forward to seeing you again hopefully soon, maybe in DK! When my daughter, Zsófi, was born, my mom gave her a little album that had some baby photos of Zsófi’s grandparents, my boyfriend, me, and a lock of hair from our first haircut and our milk teeth. The album looks like a family tree. Apparently our parents, separately from each other, collected these pieces as memories – a bizarre but not unique habit in the world. I don’t know about the hair, but losing the milk teeth is truly the moment of finishing a period in a child’s life. The moment when in many countries, including Hungary, children are allowed to go to school. The time when the process of forcing the cognitive development of children begins, and eventually the open, innocent and curious being of a child starts being overwritten. But this act of passing the milk teeth and the hair on is eventually, even more symbolic to me. My mom’s gesture of giving them to Zsófi represents the continuity of life. How life is inherited from great-grandparents to grandparents, from grandparents to parents, from parents to children, and continues further. This line has a clear direction that cannot be turned around. A child cannot be the mother of her mother, and her mother cannot be the child of her child. The line is only one way. It also implies that what I get from my mother, I can only give to my child. I cannot give it back to my mom. It often happens that the line gets twisted, the roles get confused and mixed and we – or our ancestors are simply not able to accept our role in the line. Passing on these pieces was a confirmation to me of where my mom’s place, my place, and my daughter’s place are in this one-way line. Dorothee was visiting Paris and stopped by the mobile workshop, showing us a chain of gold. She told us that her grandmother’s brother, who was a goldsmith, made the chain for her grandfather. The chain was originally a watch chain, and it was given to her father when he was sent to war in Germany during the Second World War. He was sent to Africa as a parachuter. When the Germans had to withdraw from Africa they went to Italy, where they were captured by American troops in Monte Casino in 1943. The American soldiers took everything of value from the German troops. Her father wanted to keep the chain so he hid it under his tongue. He managed to keep it hidden during captivity in Genova – and later as a prisoner of war working in the cotton fields of Florida, until his release in England on September 1947. He brought the gold chain with him when he started studying medicine in Bonn. When he moved to Düsseldorf to continue his studies, he visited a friend of his father from the military academy. It turned out that the friend had a lovely daughter, whom he fell in love with and married in 1955. The chain was made into a necklace for his wife and today Dorothee wears it. Once a burglar broke into her house and stole all her jewellery except the chain that somehow remained invisible – luckily. 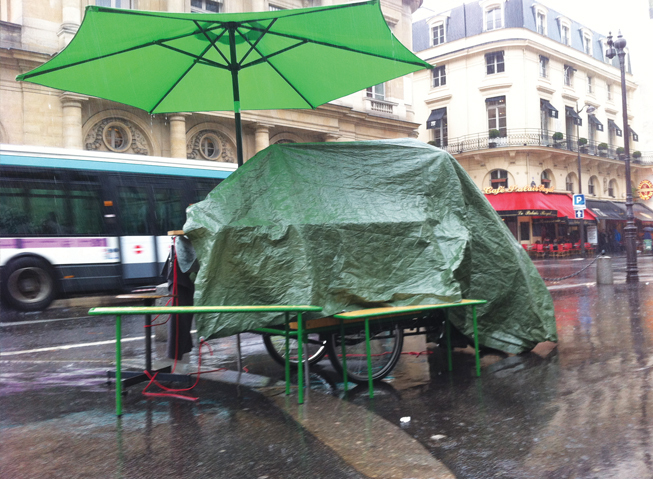 Setting up the mobile workshop at Place Colette in Paris. Parasiting the entry at Le musée des Arts décoratifs. Lunch with Amandine, Karin and Michael at the mobile workshop in front of the Louvre. The mobile workshop at the Louvre. Biking through Paris with the police in the back. Gitte working in the rain.